‘Bendy’ iPhone 6: who’s to blame? Earlier in the week, a smattering of iPhone 6 Plus owners (that’s the massive 5.5’’ one) started reporting that their new phones had bent out of shape during normal use. One owner, who kept his iPhone in his front trouser pocket, spotted that his phone was bent when he ‘saw the reflection of the window in the iPhones slightly distorted’. Can I return my bent iPhone 6? So, if you’ve bent your iPhone 6, are you entitled to a refund? Any claim would need to be argued on the basis that the phone wasn’t of satisfactory quality and would be against the party that supplied it. You would then need to reject and return the phone within a reasonable time after purchase, usually three to four weeks. And within the first six months of buying the product, it’s up to the retailer to prove that the goods were of satisfactory quality rather than you having to show that they weren’t. If your iPhone 6 wasn’t of satisfactory quality and it’s too late to reject it, you still have the right to get the phone replaced or repaired. Since a bend might be a little difficult to repair, chances are you’d be looking at a replacement. If bent iPhone 6s start to become more common, which Apple claims is unlikely, you might like to store your new phone in your coat pocket or a bag instead of your trousers. Buying a case for your iPhone 6 Plus might also be a good idea. Have you bought the new iPhone 6 or iPhone 6 Plus? Has it bent in your pocket? And if you don’t own one, have you experienced anything similar with another smartphone? It amazes me how little care many people take of their phones. Large thin smartphones are obviously more vulnerable than the small mobiles that most of us started with. I agree, cars dent went lent on, but you wouldn’t take it back and get a panel replaced if you knocked it, would you? If “yes”, please tell me which car and I’ll go out and buy it! On the same note, aren’t people who carry phones in their front or back pockets worried about getting them nicked or losing them as well? I noticed a chappie in the bus once talking to his wife and kid in the seat in front him and often taking his phone out of his back pocket, checking it and putting it back in. They left the bus sometime before me and when it was time for me to go too I noticed the phone on his seat. I handed it to the bus driver, who groaned as if it were a common occurrence… Why indeed don’t people look after their equipment better? Maybe look after your expensive purchase a little better? “The iPhone 5 had ‘antenna-gate’” – No, that was the iPhone 4, which was 27 months before the iPhone 5. I distinctly remember discovering this fault with the iPhone 4 on 24/06/2010 before it was reported by the media. The problem with the iPhone 5 was the lack of proper 4G support. 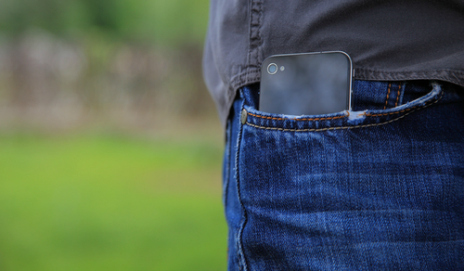 Back to the point – if you sit on a phone, don’t expect it to remain intact. It doesn’t make any difference whether it’s in a pocket or not. If you sit on it, it risks deformation. Common sense. Thanks NFH, fixed the typo. I don’t believe the reports come from those who have sat on their phone. Are Samsung not about due to release a flexible phone that hit the news last year? I like the idea of turning a problem into a feature. To be serious, do other brands of phone of the similar size to the new iPhone have a problem with bending or are they stronger or thicker? Thanks Patrick. It looks as if the phones tested are really quite tough. What I had in mind was phones that were intended to be flexible, or was that an April Fool’s joke? Rename it the iPhone Flex 6+ . Got to hand it to apple, they are marketeers supreme. They have done a fine job of convincing folk to queue up in their millions for the privilege of purchasing a flawed phone that by any sane measure is way over priced. The phone is literally a few days old and which? are advising consumers of their rights. You couldn’t make it up. Really. People are far too quick to judge, place blame and jump on the bandwagon these days. There is no real proof that the iPhone 6 Plus is ‘flawed’. After every major manufacturer releasing a new phone, stories are always quick to circulate – “my phone burst into flames” or “my charger exploded”. These ‘stories’ then turn out to be owner error rather than a fault of the manufacturer. Let’s gather the facts before we judge! I agree that some people are just waiting to criticise new products, especially with popular items such as phones. Nevertheless there are a few problems. I had a cheap Nokia phone that contained a battery that was recalled for safety reasons. I received a replacement battery very promptly. The problems with phone chargers have generally been with cheap counterfeit products. Bendgate is real. Watch the strength test video on Youtube. Sorry but are all wrong. We should look after our expensive phones? No. Apple should look after our expensive phones and make them stronger. The should be able to handle more pressure. Just because you all do nothing exciting with your lives, your phones don’t go through much, but others do. My iPhone 6 (not plus) bent when I leaned on something and my pocket pressed against it. I demanded them to replace it and it was. I have never broken a phone in my life, never smashed a screen, NEVER had a stupid case. So explain that you silly fools.